I play trombone, all styles including jazz. I sing, all styles but preferably standards, jazz, and classical. I write musical arrangements and compose music. Roger Bissell is a trombonist, vocalist, composer, song-writer, and musical arranger living in Antioch, Tennessee. Growing up in Iowa during the 50s and 60s, he studied for 8 years with Rex Peer, and then earned B.S. and M.A. degrees in music from Iowa State University and the University of Iowa. From 1971 to 1985 he “free-lanced” in Nashville, TN, playing on numerous local and national television broadcasts, commercial “jingles”, and records, as well as in a variety of local jazz and dance bands. He also played three seasons at Opryland. In 1985 he joined the Disneyland Band in Anaheim, CA and continued his free-lance work in Southern California, then moved back to Nashville in 2010 and resumed his recording and “live” work there, as well as performing on community concerts and jazz festivals around the country, most often with the Side Street Strutters Jazz Band. Roger is a member of the Nashville-based Composers Collective, and he has performed on various occasions in the last several years with the Capitol Brass, the Nashville Jazz Orchestra, the Duffy Jackson Big Band, the Tyler Mire Big Band, the Jerry Vinett Big Band, and the Paul Ross Big Band, as well as with various groups at the Nashville Jazz Workshop. 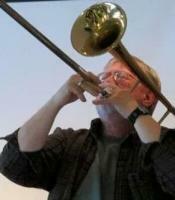 He has also given clinics on trombone playing and music careers for the International Trombone Association, Middle Tennessee State University, Belmont University, and Cumberland University, and he is preparing for publication a book on various aspects of music performance and business entitled "What They Didn't Teach Me in Music School." Some of his many recording credits are albums with Bobby Goldsboro, Ronnie Milsap, Dr. Hook, Jimmy Buffet, Michael Johnson, Amy Grant, Marshall Tucker Band, Tom Jones, Crystal Gayle, B. J. Thomas, the Oak Ridge Boys, the Statler Brothers, Ray Price, Floyd Cramer, Perry Como, Ray Stevens, and Boots Randolph, and his clients as a musical arranger have included Marty Robbins, Glenn Campbell, the Oak Ridge Boys, the National Geographic Society, and the Opryland and Disneyland theme parks.